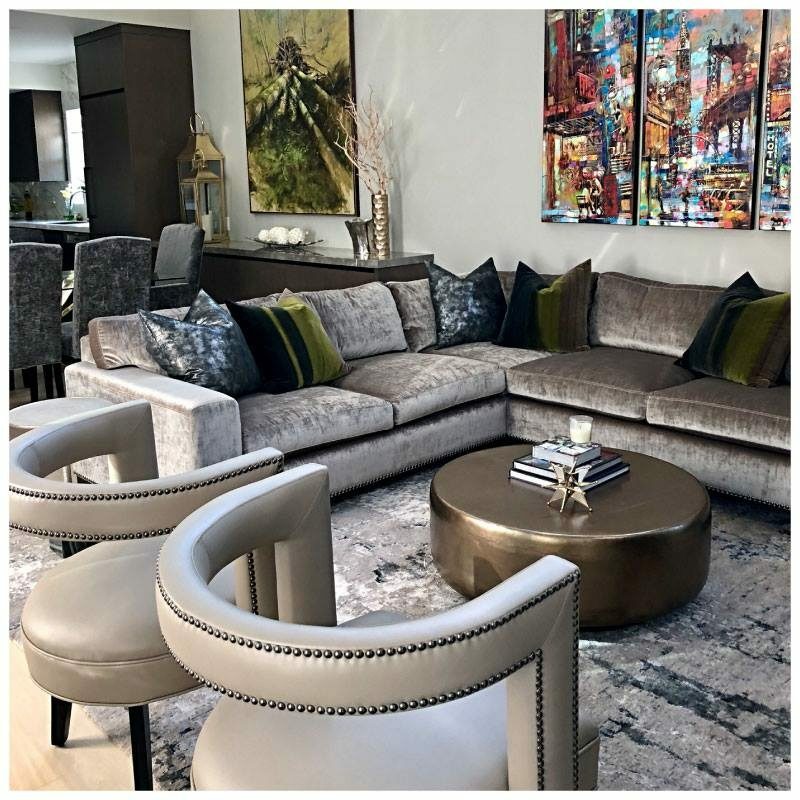 A painting is often selected to go with the room, but when the furniture reflects the art on the walls, you know there’s a master designer at work. Contracted by ARTCO International and completed by Vogel by Chervin, this chair is a masterpiece itself. Colours and lines blend harmoniously in this perceptive setting, giving the room a rich melodious comfort. Nestled in the charming village of Elora, the Elora Mill Hotel & Spa is a luxurious one-of-a-kind destination. Honouring the history of the building was important in the design and so the furniture had to be exclusive too. 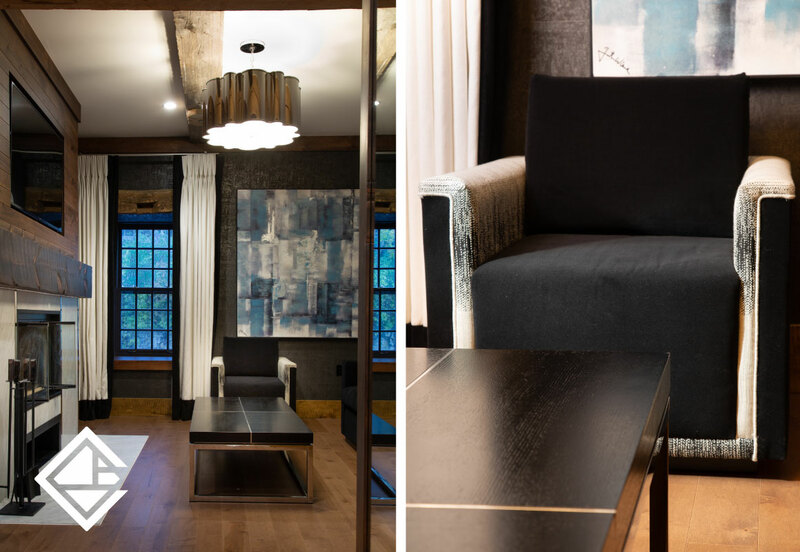 Working alongside ARTCO, our sister company, we manufactured custom furniture to swaddle each room in lavish comfort. We must say, this room is stunning! 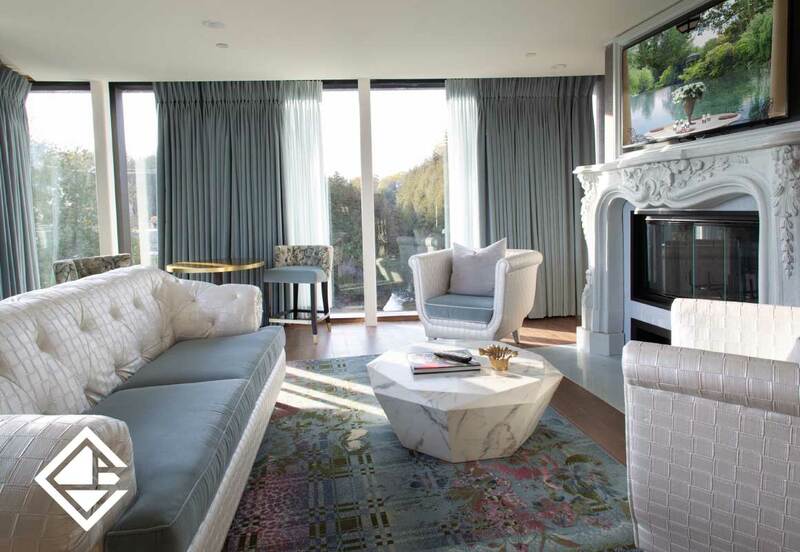 A beautiful, luxury design by Roxborough Design. Thank you for sharing these images with us, and we can’t wait to see more. Showcased are Vogel’s 11182 Accent Chair, Customized Sectional, and a glimpse of the 11232 chairs at the dining table. Such a luxurious design! As this chair traveled through our manufacturing facility this holiday season, it became known as “the best Christmas tree ever” – and we concur! Our 11870 Lounge Chair, decked in COM (JF “Gossip”) is accented with Vogel’s “Oak” wood finish. We trimmed this “tree” with our customer’s preferred custom copper-coloured nail head trim to create the perfect finishing touch to this comfortable and festive chair. Thank you to Suede Interiors for this beautiful order. We can’t wait to see what your orders in 2018 will be. 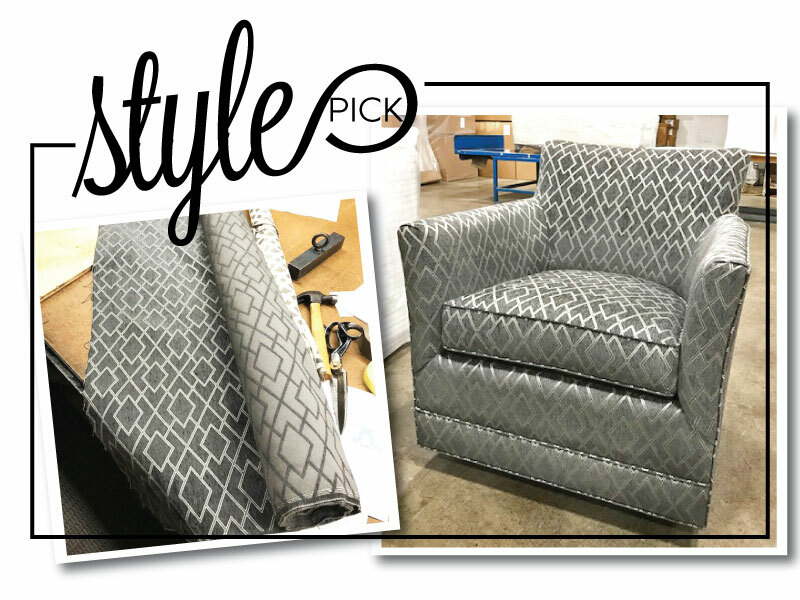 Combining multiple fabrics on one piece of furniture can be hard, but we believe Acanthus Interiors has aced the test! Choosing the 18875 swivel chair they chose to combine pattern “Chaos Linen” with a leather they provided. 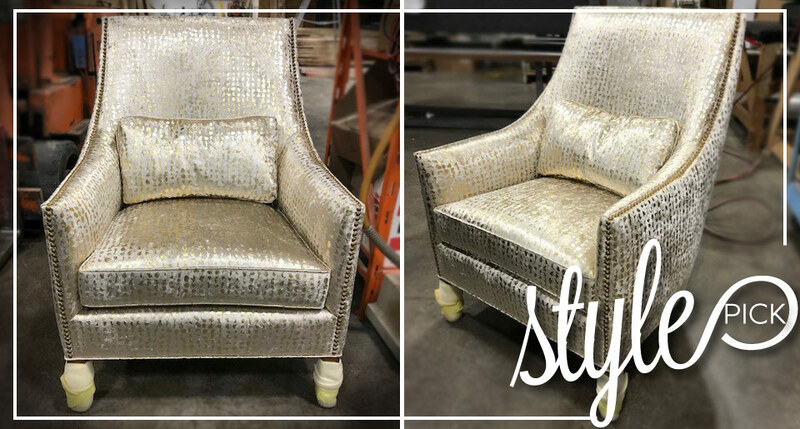 They complemented this duo with Gunmetal nail head trim to complete the look creating a beautiful swivel chair. Thanks for the beautiful order. 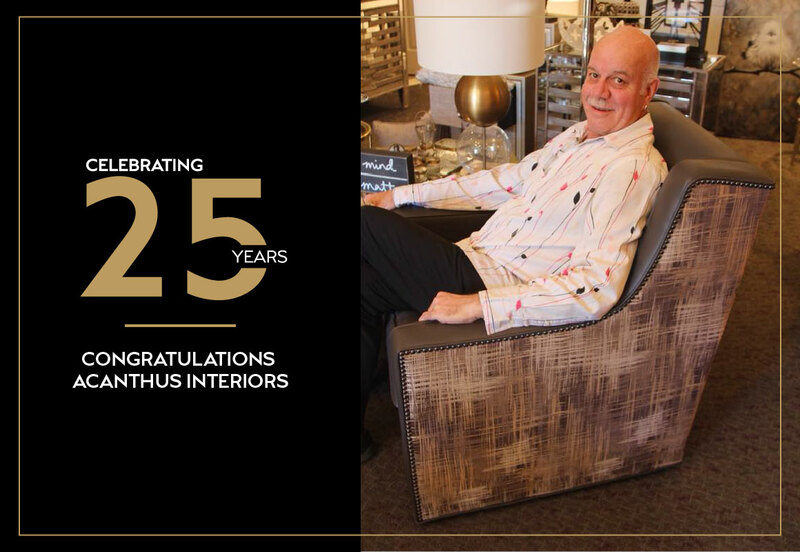 Also, a big shoutout to Acanthus Interiors as they celebrate 25 years of success. We look forward to working with you on many more project in the future! 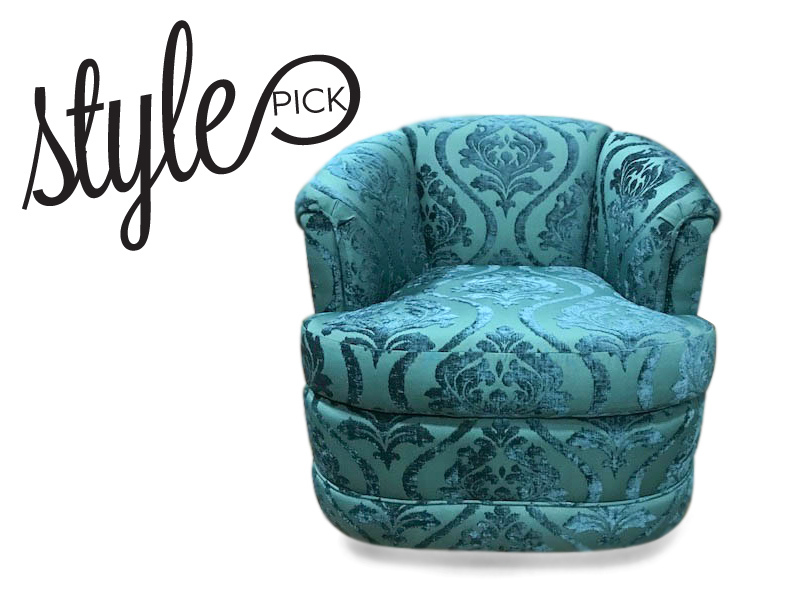 This week’s style pick by Sharyl features our 17560 Swivel Glider chair showcasing the elegant “Diamond” fabric pattern from J. Ennis Fabrics. Note how the generously crowned seat cushion balances with the tailored upholstery. We have fallen in love with this chair! Thank you for the stunning order The Decorating Centre. Looking forward to seeing what your next beautiful design will be. Competing for “everyone’s favourite chair” award is Vogel’s chair and ottoman shown here in a periwinkle velvet. It invites you to sit with its sumptuousness and keeps you there, snuggled up with a good book, for hours; but, not for a minute does it sacrifice its style and elegance. Want to be daring, but not loud? 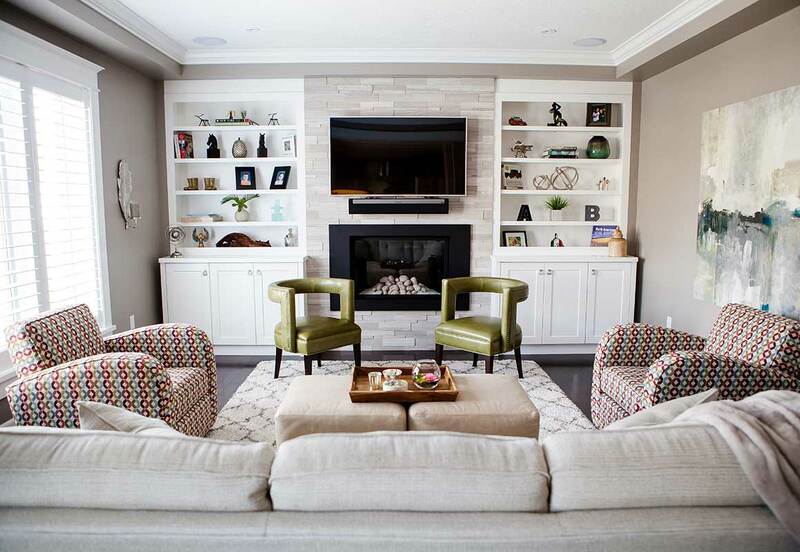 Try incorporating a luxurious colour and fabric into a muted canvas as seen in this design. 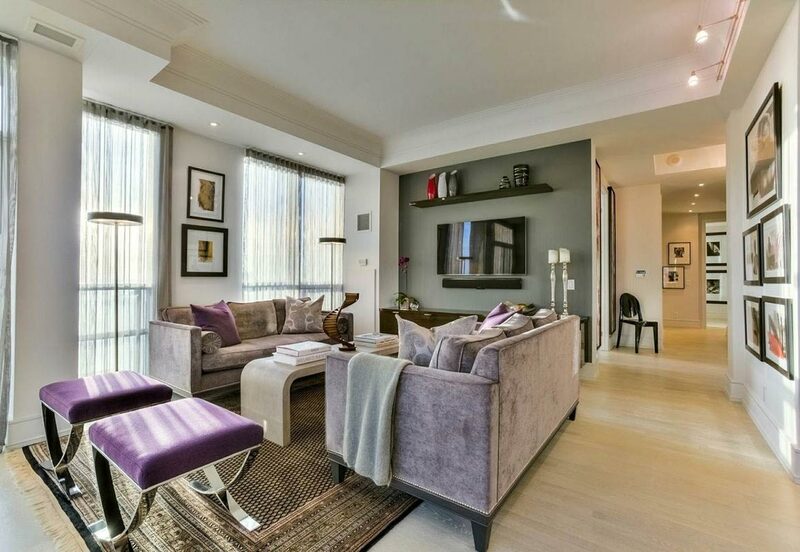 This pop of purple on a velvet sofa and accent ottomans is just the daring flare this room needs, taking it from alright to alluring.